Bio means Life and Diversity is known as the variation. The total number of genes, species and different ecosystems in a particular region is known as Biodiversity. 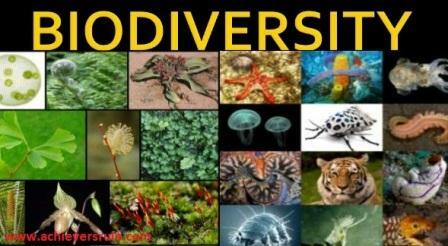 The term "Biodiversity" was coined by Walter G Rosen while the United Nations Environment Program (UNEP) and International Union For conservation of Nature and Natural Resources (IUCN) defined the term for the first time. It is also known as Biological Diversity. In every biodiversity , there are some species on which rest of the species are dependent to exist in the community. These species are known as Keystone Species.The term was coined by Paine. In case of conservation of a biodiversity more importance is generally given to these species as loss of keystone species can cause loss of several other species. There are 3 types of Biodiversity. Genetic Diversity- It consists the genetic variation within species. Species Diversity- It consists of all species of plants, animals and micro organisms in a particular area at the basic level. Ecosystem Diversity- It consists of various biological communities with lots of different species interacting with each other. The areas which has faced several threats from human activities and has a unique biodiversity, are known as Biodiversity Hot Spots. These are geographical zones which have large number of unique endemic species. Norman Myers identified Biodiversity Hot spots in 1990. Each hot spot in the world has already lost at least 70% of the original vegetation they used to have. Eastern Himalayas- It consists almost 163 threatened species including One-horned Rhinoceros, Wild Asian Water Buffalo, Relict Dragonfly etc. Western Ghats- It consists nearly 3000 endemic species like Dancing Frog, Lion tailed Macaque etc. North East India- In this biodiversity hot spot the highest biodiversity of birds of India is seen. It includes birds like Jungle Crow, Starlings, Nightjars, Swifts, Swiftlets, Barbets, Swallows, Magpies, Fintails, Shrikes, Wood Shrikes, etc. Andaman And Nicobar Islands- The hot spot is rich in different Flora and Faunas. Mono culture to meet the demand of food grains. Excessive Exploitation of available natural resources like over fishing, poaching, over hunting etc. Random Deforestation leads to environmental pollution. Habitat Destruction and Over Population. Protection of Natural habitats and limited exploitation of species. Recognition of ecosystems along with its species. To create mass awareness for environmental protection. To maintain the endangered species in protected ares like Sanctuary, National Parks etc.